Its been a beautiful albeit arduous journey for Chamasoft. We began experimenting on an online record keeping tool for chamas after I experienced first-hand the twin difficulties of financial record keeping and communications to a group of people, all with different expectations on speed of response, on their financial records and the accuracy of the same. I got to see how fast things can turn south when the treasurer surcharges some bloke, who had deposited money, but failed to indicate his name, with the said bloke foaming at the mouth,”some of us always pay our bills” with some choice expletives added for good measure. And I saw an opportunity. An opportunity, a window to extend our web apps development services to my Chama. With our able leadership, we managed to achieve alot, but something was still lacking with our record keeping. In using the conventional tools , in our case quickbooks and with meetings once a month, there was obvious disconnect, with regard to people making their payments at different times. And with our treasurer having a day job like all of us, you can also imagine the workload he had to do, that of updating records for 50 members who paid at different times of the month, some just indicating cash deposit. It was a nightmare and it was on our nerves. Like the Knight in the shining armor, I decided to challenge my team to save the day and come up with a replacement of quickbooks. 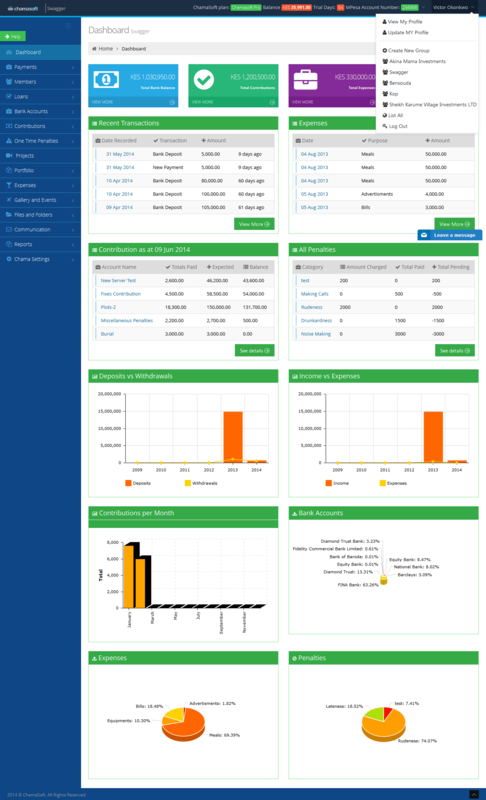 We thus began working on our spare time on this small web app for my chama. We came up with an initial set of requirements and began working on our first version of what came to be known as Chamasoft. I am very ashamed and amused to look at these screenshots today, but I realize that if we did not start with these bad looking designs, we would not have chamasoft as we know it today. We took the first step. We began with boldness and ignorance, thinking it was a project for one group, which we would place in a sub-doman and then move on to our usual web design projects. 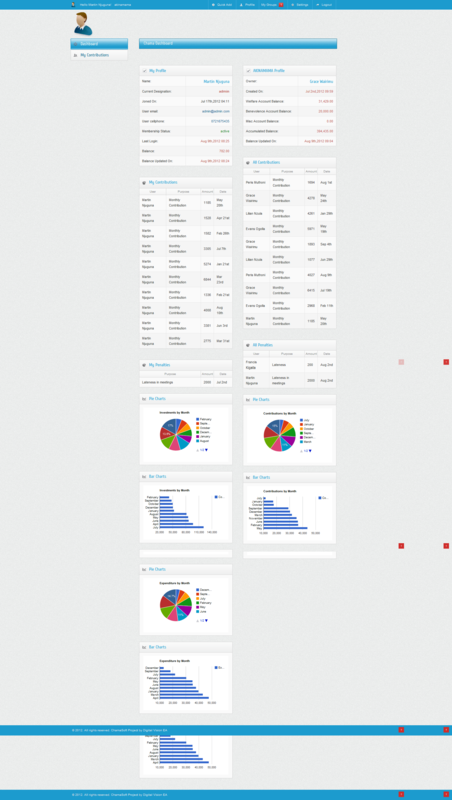 Below are some of the screenshots of our initial version of Chamasoft. Inspite of the initial design being lame, we BEGAN and at least demonstrated the idea to 1 chama and then to 12 chamas.And like many first versions, our initial web app was bad! It was clunky and did not work as intended.This deeply annoyed the 12 chamas that we began testing with. Why they would adopt our monstrosity instead of using excel sheets! Like Terribly wrong. We assumed that people hated excel sheets. We assumed that we were ‘know it alls’ who would just come up with a software based on what we knew-Which was really limited. So Instinctively, we sought to go out and meet with accountants who presumably dealt with groups! We took our afternoons to meet with a friend of ours, an accountant and an auditor, to discuss what Chamas would need. And we learnt alot of accounting words like GLs(General Ledger), TB(Not tuberculosis but Trial balance) and created a “better system”. Lo and behold , we went back to our select 12 groups for reviews and to demonstrate to them, ‘exactly what they needed!’ Shock on us! The system was now even more complex than Excel Macros, More complex than quickbooks. We had basically spent 8 months ‘innovating in situ’, building bloatware, that the world did not need! We were more than dejected! We had to bite the bullet and throw away all the code. I am really sorry to my initial team led by Samuel wahome, who had to throw away the baby and the bathwater! Oh and what was the result? We applied and got shortlisted for Demo Africa 2013 where we went ahead to pitch our startup and formally introduced ourselves to the world. I did the pitch while our very good user researcher at the time, Edwin Njoroge did a video introduction of Chamasoft for the Event organizers. We got all sorts of propositions from busybodies, experts, brokers on how we needed to work with them to make this thing big, otherwise they would obliterate us with a new software they were working on. Or they could separately get a Grant or seed funding on their own and then launch a similar startup by themselves and that would be end of our world. They would bury us alive. They would have us for lunch. We laughed and pressed on. We doubled down, shoulder-to-the-wheel, pedal-to-the-metal to set up all sorts of groups who were finding us online and adding some small features which customers kept on requesting. And we got invited to all sorts of competitions First was the ICT Ministry’s ICT innovation award in Finance Category which we won that April of 2014.And life has a way of jolting you back to reality.The day I arrived in Mombasa to find out whether we won, the moment I checked my email, my heart sank. Two of our developers decided to send me resignation letters within 20 minutes of each other. I wanted to pee on myself in that cool business lounge at Leopard Beach. Were they mad? How could the duo dare leave this upwardly mobile- world conquering startup?Over lunch, I thought about this and it hit me! I had not communicated the vision of where the company was going, we were not sure whether we were a web design company or a startup and we were not even making money,just relying on luck for us to make end month payments. I was the nincompoop. The leader in me had failed my team, if there was a leader at all. The whole day I kept checking my emails over bad WI-FI, waiting for the whole team to resign. When someone from the next office gave me a call, I feared the gang had burnt down the office.It turned out he wanted to find out if I was around we do lunch. I was relieved.We won the award the following morning and I was happy at least my Mombasa trip was not in vain. Now, the famed investors and ‘angels’ would come with blank cheques. Boy was I wrong. Again. We then applied for Mlabs Pivot East and won the Finance category and USD 5000. Five thousand Benjamins baby. If only John Kieti, Sheila Birgen and the rest of the team know how much we learnt and how much we yearned for the payment! Like that payed our ovedue salaries and left something for the next month. That was like a validation point.We pitched at IBM smartcamp and won to represent Kenya in the African Finals. However, we did not attend the Finals in Joburg since this coicided with the Evernote awards in California, where we were the inaugural recipients of the Evernote Africa Innovation Award , where wentrounced the entrants from Kenya, Nigeria and South Africa! So we got to see the Valley in 2014. We felt validated now that we were the jet-setting startup-troucing team straight-out-of-africa! The hunger was still there. So what if we went to Silicon Valley? What did this mean for our customers? How did this benefit our end users? An Obsession grabbed me! I needed to find a way to get more customers. We were having more signups, having had 7 unaffiliated customers (Paying users) who had actually pushed us to announce our pricing and they had paid us! You can see clearly we made alot of mis-steps in our pricing We had about 400 customers(groups) who had signed up to try and become customers. An obsession is a bad thing. It led us down a dark road. According to the script we were following in our cocoon, we were this hot startup and we only needed to knock down a few doors and voila, alot of money would be thrown at us, since we were saving the world! We started looking, better googling, other startups in the tech news who had received funding and we would immediately send a cold email stating in very many words, throw us some money too. Our Pitches reeked of “me too” and they were treated and rejected with the contempt they deserved. The polite ones responded with some feedback of how to improve our approach and sent us some questions, which have really helped us in shaping our business path. Meanwhile, we were still figuring out whether to keep chamasoft as a side project or to establish it as a company. One of the most unassuming people I have ever met, Ory Okollo Mwangi, was very forthright and rightly advised me to make a clear distinction between Chamasoft and Digital Vision. The same feedback had been received from a nice chap Mr Nate Gonzalez who was at that time with Accion Venture lab, the lead in Nairobi at that time. We made the decision to establish a different company which would be focused on the product and its customers, while the Mother ship, Digital Vision would continue to feed us and pay our salaries. The excitement of the media stories died and the trickle of signups we were getting reduced. We had to begin again.How do we drive traffic to our website and hopefully get people to try out our product on the cheap? We hatched the idea of blogging on various aspects of Chamas/groups with a view to educating customers. To this day,this has been our cornerstone in bringing visitors to our website and it generates many free trials. We also experimented with paid facebook ads but we found that was giving us a lot of new traffic but most of it were junk signups. This again informed us of the need to open a demo account on our website where someone could test drive the platform without signing up. Majority of trials which convert without hand-holding discover us through google search, which leads them to our blog, which then leads them to try the platform. We continued thinking about how to sign up many customers at once and that is how we stumbled upon the idea of partnering with other players in the sector who were already serving our target market.That is how we began our search for partnerships. With a mix of great expectations and episodic trepidation, we approached our first bank, who were our web design client at the time, with the idea of them having a value add for their chama account holders. Are you still there to know if we did this right? Politics kicked in, servers that we knew we never needed were added as part of the requirements by the infrastructure teams, but anyway, we managed to begin a POC and did our integration. We even managed to do customer visits and branch visits to train some of the bank staff. The only good thing about this is we proved to ourselves that this was a worthwhile for our customers as customers saw the value we could bring with bank integration. And we were lucky to have the bank accept to commit a small payment for the POC. However, this was short-lived as the banks’ commitment to the project dwindled and the project personnel were scuttled. We were left with egg on our faces when customers who previously could get the bank feeds(deposit and withdrawal alerts) could no longer get them. Best lesson out of this? There was much value to chamas and users with bank notifications! We then approached an MFI which was dealing with alot of groups at the time. Ever heard of Musical Chairs? Ever played in some Musical Chairs Game? We really got played on this one. We had meetings and we discussed our approach to the the partnership, signed NDAs, worked on MOUS , the works. Everyday, the reason was different why we could not begin the integration. The core banking app needed to be tweaked to accommodate third parties, they needed hardware which would cost the bank gazillion amounts of money, they did not have a focal person or a Project manager , they needed to know who else we were partnering with first. They actually needed to see if we can make brochures for them (Oh, which we did). Oh, could you guys do a seminar with us and invite your groups to our seminar? (We did!). My oh My! Until one day, we received a letter from them saying we should stop pestering them on the integration. Don’t call us, We will call you sort of tone. We still have the letter with us for posterity! This goose chase took a whole year! If there is one time sink I regret, it was this game of being played waiting for something to happen before our integration could be done. Lesson learnt the hard way, don’t waste time chasing potential and waiting for someone to make the decisions. Its a 2 way street. We lost a lot of time and we still have bloodied noses from this goose hunt. Maybe we should have stopped pushing for the partnership and focused on getting customers with another partner or by ourselves. In hindsight, we are grateful for this failure in our second attempt at partnership since its what has helped us build a solid base for partnering with other organizations going forward. For instance, in 2015 we succeeded in getting our first partnership where everything was aligned and there was partnership commitment from one of the leading banks in Kenya. Customers are very happy about the bank feeds they get on the platform and our partners whitelabel platform. The Normal curve for diffusion of Innovations is real! 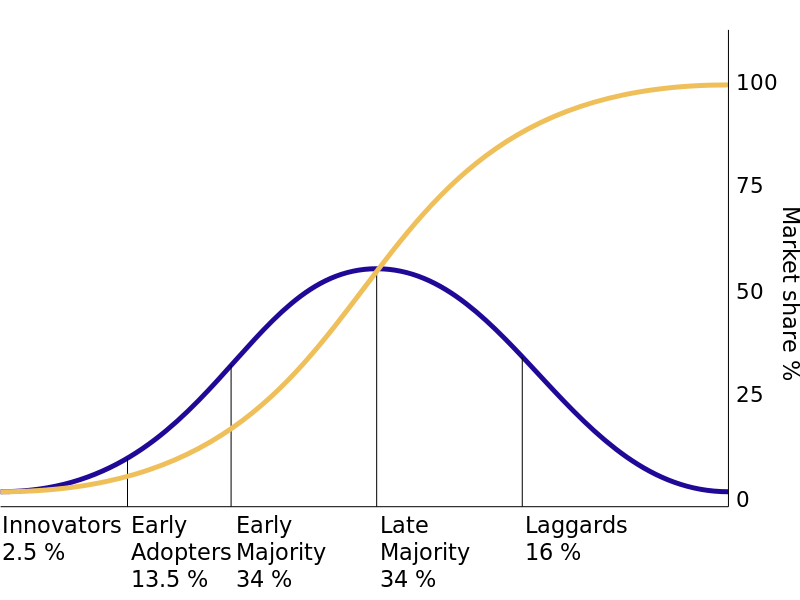 I used to think that the law of diffusion of Innovations is some nice to know theory. However,we have seen this to be true in our growth in Chamasoft. Below is a original curve from the seminal work by Everett M Rogers . If we look at our growth, it highly correlates to the curve. At this time(April 10 2017) we feel we are at the early adopters stage. Remember all those stories above about our media hype, expectations, eyes-wide-open with glee at , imaginary ‘heaps-of-money’ waiting for us since we are saving the world? That was our peak of Inflated expectations! We even thought of dumping Chamasoft altogether sometime back and that is when we were falling fast from the peak :). 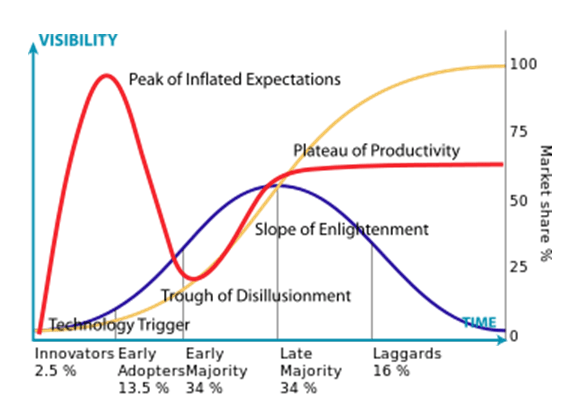 Our experience is reflected very well in the hype cycle by Gartner . See below. 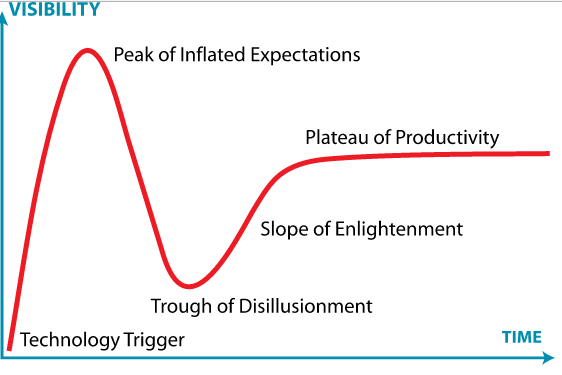 We are yet to hit the very bottom of the trough of Disillusionment. Is this a good thing? We think so, because that is the only way we are going to break into the early adopters phase! Becoming a transactional Platform: Instead of having chamasoft as a record keeping tool, we want to experiment with Chamasoft being a fully transactional app. This needs deeper bank integrations and possibly more partners in the payments space. Will this be easy? No. Will it need new resources, new partners, deeper integrations with existing partners? Yes. Will it lead to mainstream adoption? Maybe. We are happy to work hard on that maybe and even if we fail , we are surely going to learn. Will it take time? I am guessing it will be another 7 years for us to run the whole cycle and discover whether this was a good solution- See the time curve above. Back to work until the next post! Wao Martin. I am convinced you will make it big…very big. Indeed it has been a long journey full of valuable lessons .And the writing is superb . Well done mzee! Well done! Thanks Rad. One day at a time my fren :), lots of people only share when they succeed, but there is a lot to be learnt in failures and setbacks. Very nice article to read, very enlightening. Im so lucky to have been apart of this journey! Thank you for sharing. Very cool. Wow​ thats one heck of a journey, will definitely learn a lot from your journey men. Hi Kevin, Thanks for your comment. We will strive to keep sharing what we learn. Great journey my friend ! The next years will have a huge growth, I believe !